J. Alex Haller Jr., Johns Hopkins pediatric surgeon who gained fame in separating conjoined twins, has died. Dr. J. Alex Haller Jr., a retired Johns Hopkins pediatric surgeon recalled as the “father of pediatric trauma care,” died of respiratory arrest Wednesday, June 13, 2018 at his Glencoe home. He was 91. He was a professor emeritus of pediatrics, surgery and emergency medicine at the Johns Hopkins Medical School and was the surgeon-in-charge of the Johns Hopkins Children’s Center for nearly 30 years. “Putting yourself in a child’s shoes is part of being a good surgeon,” he once said. Born in Pulaski, Va., he was son of J. Alex Haller, a dentist, and his wife Julia Allison. Emerging from scarlet fever as a young child — he lost his hair permanently as a result — he was determined to go into medicine. After the death of his mother, he was raised by his father and two maiden aunts who instilled a strong moral sense in him. An Eagle Scout, he was a 1944 graduate of Pulaski High School, where he played basketball and football. He obtained a bachelor’s degree at Vanderbilt University, where he met his future wife, Emily Simms. She would go on to become an obstetrician. While in medical school, Dr. Haller also studied at Boston Children’s Hospital, where he developed an interest in pediatric surgery. After graduating from Hopkins in 1951, he entered the surgical residency at Hopkins and studied pathology at the University of Zurich for a year on a Rotary Foundation Scholarship. He did his military service in the Coast Guard — he said he was mainly called upon to remove tattoos — and at the National Institutes of Health. 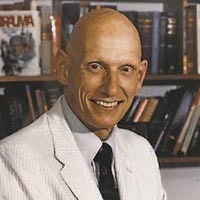 He performed his residency at Hopkins and joined the faculty of the University of Louisville in 1959, where he served as chief of cardiac surgery at the Louisville General Hospital. The renowned Johns Hopkins surgeon Alfred Blalock asked him to return to Baltimore to head a new pediatric surgery division. In 1971 Hopkins opened the country’s first pediatric emergency room within a general hospital. In an article in The Baltimore Sun about the opening of the new facility, Dr. Haller said he did not like mixing children with adults in crowded general emergency rooms. In 1982 he led a surgical team that separated conjoined twins, who were connected at their chests. The twin girls, Emily and Francesca Selvaggio, were separated in a 10-hour surgery. He published more than 350 scholarly papers and 60 book chapters. He wrote several books, including the 1967 work, “The Hospitalized Child and His Family.” His daughter said her father and mother were a well-known couple, particularly in the Hopkins medical community. “They were true partners, and each year hosted back-to-back Christmas parties on Friday and Saturday nights so that whoever had the weekend rotation could attend,” she said. “They served country ham and crab dip. Everyone sang Christmas carols late into the night,” she said. “On family vacations, they canoed together. When we were young, they spent a month as our camps’ doctors in western North Carolina. My father threw himself in all the camp activities, too. “It’s not hard to see why children loved him,” she said. He was the recipient of the American Academy of Pediatrics’ William Edwards Ladd Medal, the Denis Browne Gold Medal, the British Association of Pediatric Surgeons’ award and the Vaclav Kafka Medal from the Society of Pediatric Surgery of Bohemia. A funeral will be held at 11 a.m. June 23, 2018 at the Episcopal Cathedral of the Incarnation, University Parkway and St. Paul Street. In addition to his wife of 67 years and daughter, survivors include two sons, J. Alex Haller III of Asheville, N.C., and Frederick B. “Fritz” Haller of Winston-Salem, N.C.; another daughter, Clare Haller Hughes of New Canaan, Conn.; 16 grandchildren; and his brother Dr. Thomas B. Haller of Pulaski, Va.